I’m beginning to think that my status as a bona fide wimp may be in jeopardy. This is the second zombie book I’ve read within a 12 month period and I’ve really enjoyed them both. Both were good for completely different reasons but great all the same. 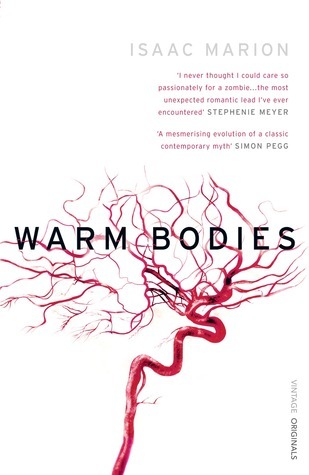 Where This Is Not A Test was (mostly) edge-of-your-seat and run-away-from-the-zombies in style, Warm Bodies is much more thoughtful and looks at life from the perspective of the zombies. Rather than plonking zombies in amongst fraught citizens and just hoping that readers go with it, Marion takes the time to build a world where readers can identify with the humans that are clinging to vestiges of the world that they knew while zombies populate the world they live in. It’s a dark world with apparently little hope for the remaining humans but it wasn’t really their story that I found drawn towards. R is one of the more…sensitive of his kind and can faintly remember that he had a life before the endless pursuit of human-food, if not the actual details. Enough to know that his first inital was ‘R’, that there is more to life than preying on people and that music can make almost everything better. Despite Marion’s zombies being the full-on brain-eating kind, R is unbelievably charming. When a zombie consumes a person’s brain, they get to “live” that persons life for a few moments, experiencing flashes of their memories and seeing glimpses of the world through their eyes. When R encounters Julie and her friends while out hunting for fresh brains, he goes against everything he can remember and protects her. While she is stowed away in the aeroplane chassis he calls home, R gets to know Julie through less…conventional means. The development of R and Julie’s relationship is adorable. For a being that can’t talk, R is surprisingly communicative. Using the snippets of language that are coming back to him, gestures and his collection of albums, R manages to convey to Julie that he isn’t planning on devouring her and helps her start to get to know him. There are enough reviews of this book out there now that I’m sure I don’t need to go into the connections between Shakespeare’s play and R and Julie. They aren’t always the most subtle but it never bothered me at all. To be honest, there are plenty of quirks on the story that we all know so well and so much that makes this book unique that Marion could have followed whatever famous story he wanted and I wouldn’t have batted an eye. The latter half of the book has more action and a little less musing on the nature of society and is heart-stopping for a different reason. It’s a relatively short book to begin with but it’s brilliance makes it fly by. I could have spent twice as long with R and will have to console myself with the film during the long wait for the next instalment. Source: Received from the publisher via NetGalley in exchange for an honest review – thank you, Vintage!